Crumpled money stuffed in overall pockets. Loose change clanging against the sides of the washing machine. 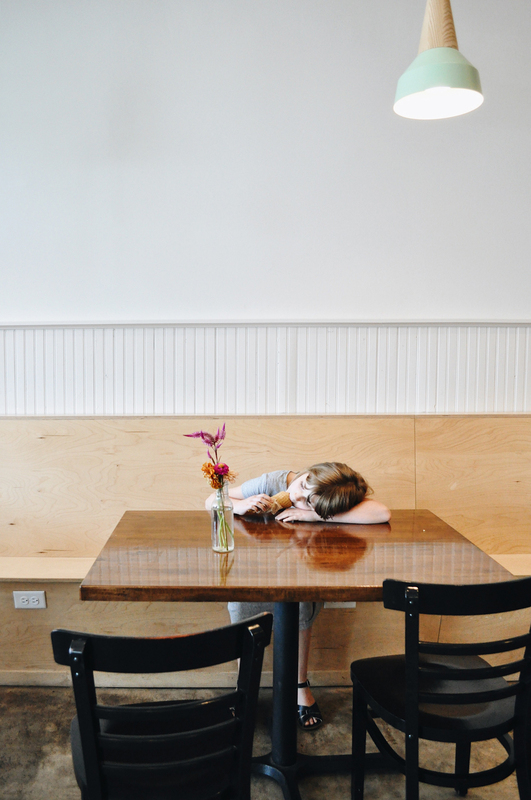 The never-ending confusion over how much allowance has been earned, spent, and earned again. If you're anything like me, your kids each "have" x amount of dollars, but the money isn't really anywhere. In reality, it's all just jumbled together in a family pot that grows and shrinks, mostly spent (by me) on the regular. The kids all keep a mental note of how much they "have", and when they will want to buy something, I'll buy it, and they just subtract it from the amount they keep stored away in their heads. This is a dangerous proposition, particularly for younger kids who don't exactly know how the labor difference between a Benjamin and a Lincoln. There ain't no way that amount is ever accurate. We play it to our advantage, too. "If you guys find Tommy's shoes (a dreaded continuing melodrama motif) we will give you a dollar." You found them! "Sorry, no cash. Put it on the tab." Money has become another category of disarray, keeping company with the laundry, homeschooling, and my daily hygiene (no judgment). My B-type personality is always on the prowl for a way to bring order because, with a family this size, every little thing you can streamline and better organize, the more smoothly things will run and the less cluttered your mom/dad brain becomes. Precious. Uncluttered. Brain-space. 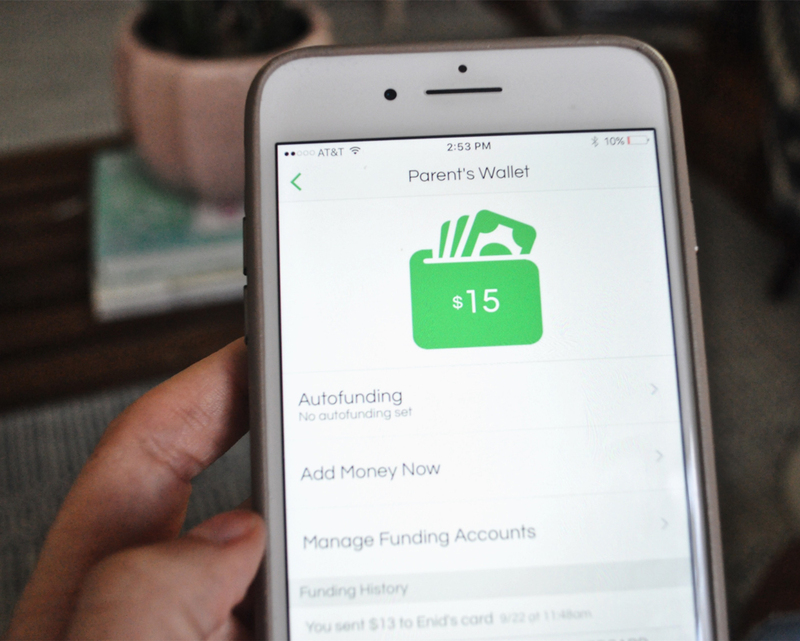 This week the sun's rays shined on the problem when we introduced the Greenlight app into our kid's money-management situation. Praise-hand emojis and awkward dance moves have already been executed. Coveted brain-space looking for new subletting. In simplest explanation, Greenlight is a debit card for kids. But it is actually so much more. It's simple: Transfer money from your account to your kids' "wallets" with a click of a button. It's a genius, user-friendly, money-mangagment game-changer. So say Silas found Tommy's shoes, and I owed him a dollar. I can open the app, click on Silas' Card and then the "Add Money to Card" option. Then you just type in the amount, and it's done! Just like that. This is especially helpful with older kids. Now that Tristin is in high school and is (trying to be) more active socially, she might be out with friends and go to use her card, only to realize she's out of money. All she has to do is text or call me and let me know she needs some cash, and I can get it to her within seconds. 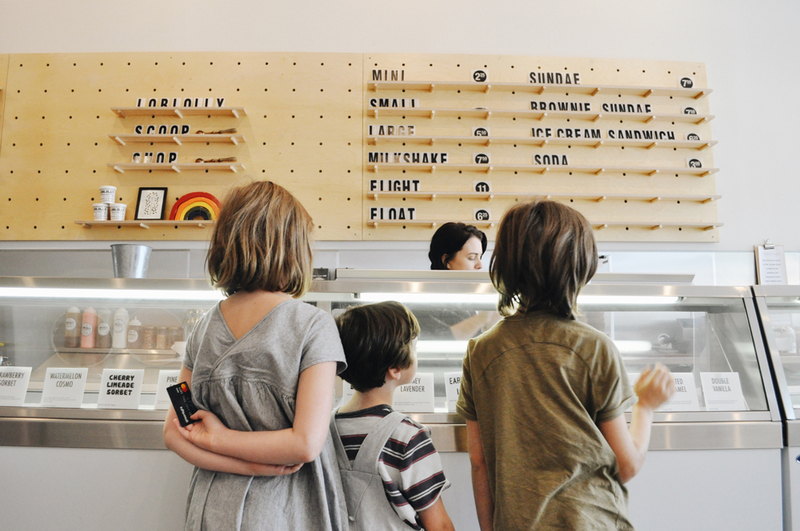 Parents can also specify the type of store where the money should be spent. So if you want to give your driving teen some gas money, you can add it to the Greenlight card and specify that it is only for gas, and he/she can't spend it on cheeseburgers and video games. No more wasted, wadded up cash and coins in pockets or under beds, AND no more broken down abacus in my brain! Organizing one aspect of my life always opens up the chance to do other things better. For years, I have wanted to arrange a chore chart of sorts for the kids so they can learn to work for money rather than just collect it at every birthday or Christmas. But because I am generally terrible at organization of any kind, I have always gotten deterred by the idea of having to keep up with the money part of the chore chart. But Greenlight inspired me to finally make this a reality. I put together a really simple chart we can print off and fill out each week, and it has (so far) revolutionized how things get done around here. I'm not constantly giving orders anymore! And they know if they do their tasks, they earn money, and they can now check in on the Greenlight app and see how much they have. Money can also be moved from the kids' account to mine, like if they do something they shouldn't, or don't do something they should. The newfound sense of responsibility has also opened up chances for Heath and me to talk to them about all the ways we use money: to save, to give, and to spend. They're familiar with the latter quite well. 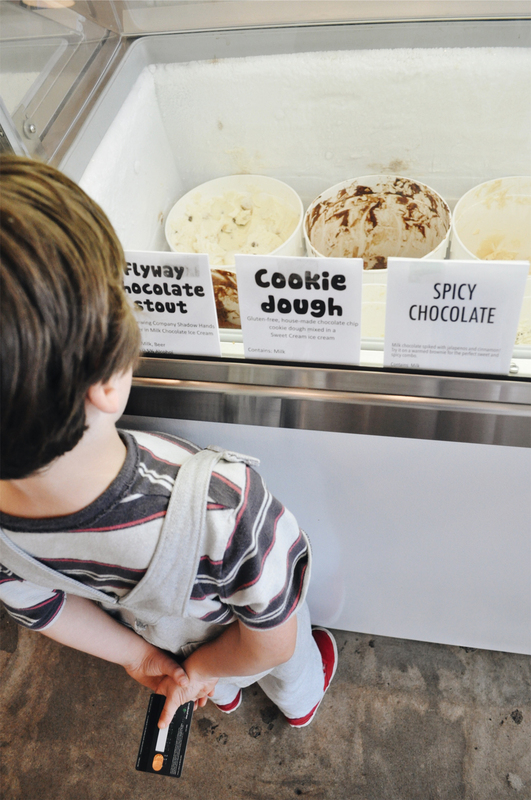 With their cards in tow, we went to one of our favorite ice cream shops to let them get the hang of it. It took Tom some time to figure out that the card was his money. He kept looking at the card and asking, "But where IS the money?" It's an interesting concept to try to explain to a five year old. After a few minutes discussion of the basic principles of microeconomics and finance, I said, "It's just in there." He really just wanted to be certain the card was going to get the ice cream in his hands and into his mouth, which it did. I especially enjoyed watching the kids grapple with learning to swipe and sign. Silas was concerned because he thought he had to have some fancy signature. The next day he asked if the way he signed his name when he checked out at the ice cream shop had to be the way he signed his name from then on. Kids are the greatest. Now, Enid, who has always had a special affinity for food, was eager to order the size of her choosing since it was her own money she was spending. I never let them order a large size because I have so many to pay for, and it adds up so quickly. So she went ahead and ordered the large, and boy was it ever! A lesson in cost-benefit-analysis, delayed gratification, or the spoils of capitalism: it's yet to be determined. 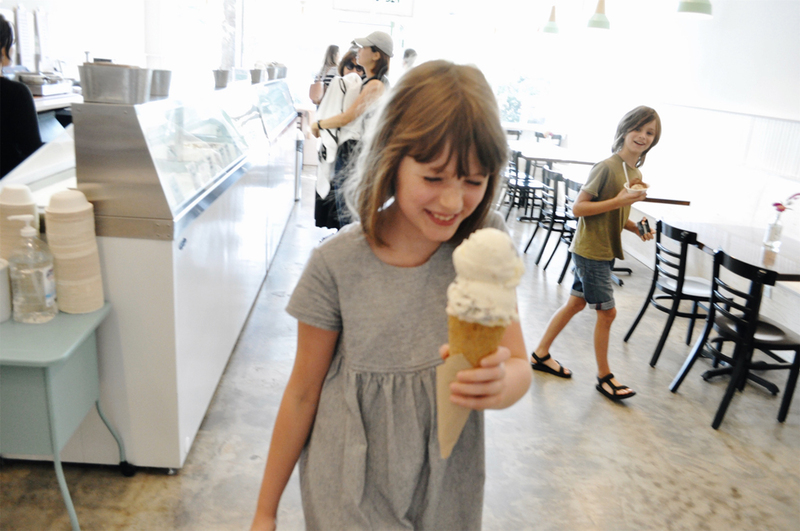 And here is Enid, after everyone else was already finished, determined to finish that hard-earned large ice cream cone. **This post was sponsored by The Greenlight App. All thoughts and opinions are my own.